OFFICIAL figures on the “mortgage crisis” overstate the number of households in real trouble – and lack key insights into how deep the problem really is. An investigation by the Irish Independent has revealed the Central Bank’s figures include several types of borrowers who are no longer in trouble. A large number of senior bankers right across the industry who spoke to the Irish Independent now insist the situation is improving. The latest statistics, however, indicate that 77,630 households are at least three months behind on payments. But these figures include: – Those who missed payments long ago and have since resumed paying normally. Why don’t the banks make this information public then? And when the say ‘repaying normally’ does that mean ‘interest only’ or full capital and interest? If there is any recovery by definition some of the arrears should start to move down the ladder, you’d see the 6 month figure drop and the 3 month figure rise, then the 3 month figure drop as people move back out and into being up to date. That doesn’t seem to be reflected in the numbers, rather what we see is trend towards going into arrears then moving into the 180 days plus category. Look at the table, there might be borrowers who are in there who are not in trouble, but in the early arrears they numbers in there have close to doubled, meaning those who cure are being replaced and the rest are at best sitting still. That there is some people getting better may be occurring – look at the 3rd column and you see some red numbers, that is when the people in 90 days actually dropped, but chances are that they didn’t drop into repayment, it is as likely that they dropped into the 180 days plus (see the corresponding change there) – you can’t go from zero to 180 days behind so the flow is important. That is in the final column, and it shows that at any time the people coming into arrears or moving up are impressive, you’d want to see some stagnation there to call a change in trajectory – even if there are ‘improvements’ that are not showing up, people would stop going from sub 180 days to greater than 180 days. – Those who fell behind and agreed ‘restructuring’ deals with their banks to lessen monthly payments. This is partly covered by the Central Bank figures, it shows the restructures and the breakdown of type, the idea this story is pushing is effectively that people are only going into the ICU rather than palliative care, a strange thesis at best. Of course there will be some ‘peak’ in arrears, and many bankers are saying it will be this year, but many of them said the same thing last year, so until the worm turns this is a premature assumption which if correct is more due to chance than analysis. Check out the total unpaids, if significant numbers of borrowers were sittings still (not deteriorating is an improvement) then the amount that remains unpaid should not be going up, but again, we see this as a ‘single observation’ in Dec 2011 figures where it only got worse by 3.43% otherwise it is in double digits (see below). – Those who have successfully done more informal deals to work through their mortgage problems. – The financial situations of borrowers in arrears. – The number of borrowers in arrears making zero repayments on their mortgages or the number who have done informal deals. Not only does this imply that the Central Bank are not doing their job, but it also doesn’t answer the question it poises. The Central Bank are not responsible for knowing that information so why would they have it? The banks are the only ones who could realistically hold this information as it is customer oriented specific data that is difficult to collect. In truth the banks don’t have this full data themselves, but what we don’t hear from any people we speak to (because a huge swathe of ex-brokers are now collectors, along with most of our broker consultants and bank contacts) is that people are doing better, or at least staying still – the trajectory has to change for that assumption to hold. It means that although more than 40pc of homeowners are still living with negative equity, the number of borrowers unable to pay their mortgages is far lower than the official figures suggest. The Central Bank figures — which show that more than 10pc of households are in arrears — also fail to capture a “significant” improvement in payments that some senior bankers claim they have seen. This is because the quarterly reports focus on households that owe more than three months of mortgage payments. This means that a change in arrears cases won’t be reflected in the figures for three months. Arrears and negative equity are linked, the central bank has shown this as have Blackrock who analysed Irish mortgages. You can’t merely overlook this, as for capturing the ‘significant improvement’ – show it, because the flow of figures, the actual unpaid amounts and the flow from low arrears to large arrears speaks for itself, of course any improvement in 3 months won’t be reflected, but this is really saying that by the next set of figures being published we will see the trajectory change – meaning you have to see the flow (as above) or the trajectory (also above) stagnate or reduce, or even slow down significantly for this thesis to hold. Since the last set of figures only goes to the end of March, the “latest” surge in mortgage arrears could be due to an increase in people running into trouble late last year, and not a fresh crisis. Our investigations also found that even if a homeowner missed their payments long ago, and are now paying their mortgage normally, they can still be counted as being “in arrears”. This ‘surge’ could easily be an accounting issue, if the low figures for December 2011 reflect an inability to report the full amounts or process new cases it could be that you get a series who appear in the next accounting period, and thus you had a low ‘single observation’ event as we saw in Q4 2011 make Q1 2012 look ‘big’ in fact it is probably just plain old vanilla deterioration being evidenced at different rates due to when the figures show up. Anybody paying their loan would again result in reduced flow or reduced unpaids from headline findings. This can continue for many months until the old arrears are added on to their mortgage balance, or paid off. People who have agreed restructuring deals are also being counted as ‘in arrears’ until they have worked up a track record of making their new repayments. All true and correct, but without any evidence how can one make this call? Anecdotally (we are all working in the same fact vacuum) nobody we spoke to said this is the case, if the collectors on the ground are not seeing this then all it means is that the people who got knocked out are on the canvass and staying there, they are not getting back up (unless by that you mean servicing the interest or another ‘repayment’ which is sub-standard to what is expected by the contract – we are in for a few years of advanced forbearance at best. There is also a distinct lack of information on how many borrowers are unable to pay because of temporary factors such as losing their jobs — and how many are never likely to be able to pay back the home loan. This gets down the cause of arrears, generally it is expenditure or employment shocks, what we do know is that employment and arrears have decoupled, this could just as easily mean that people used up their savings and have now passed into arrears, it could mean widespread strategic default, it could mean anything really. The information is not ‘lacking’ it is simply difficult to collate and not held in a central repository, this doesn’t prove or disprove anything. There are no figures on the amount of people who have completely stopped paying, nor how many are actually making an effort to work with banks despite being in arrears. And the Central Bank could not give a number for borrowers who are have agreed informal deals with their banks. Such deals might include overpaying a mortgage for a number of months in order to clear a backlog of arrears. To a degree we do know that people have in many cases stopped paying, the Central Bank figures show that in some cases moratorium agreements were made, you can get a moratorium in the morning by cancelling your direct debit, and while ‘arrears’ are also made up of what we call the ‘slow grind’ – where you miss 1/3 of a payment for 9 months you end up 3 months in arrears – the prospect of a return to full health is the issue, is that forthcoming? It’s hard to know and harder to call, so we resort to using the official data to see if it is the case, again, there is no clear evidence of this. The Central Bank figures suggest that less than half those in arrears have agreed ‘restructuring’ arrangements with their banks — leading to the common view that the other half are doing nothing about their situation, when in fact many of the others may have informal deals. The Central Bank is gathering some of the missing information, but has not yet made any of it public. Informal deals are difficult to articulate, not least because banks do have a reporting responsibility to the Central Bank – that is why we know the number of restructures, reduced payment, moratorium cases etc. ‘informal deal’ is not a defined status, if it falls under any structure currently acknowledged then it would show up in the central bank statistics. Senior bankers say that even though it might “look like” the mortgage crisis is getting worse, things are actually getting better. This is because it takes time for ‘solved’ cases to find their way out of the statistical backlog. We pointed this out already, things could be getting better but the contraction in credit can give a false read if it reduces quicker than the arrears, but when you break it down into flow of loan accounts, the actual unpaids and the variation from one sector to another you don’t see it, so while this is true, it is not reflected in the headline figures. It’s not really different than saying ‘unemployment could get worse if lots of people emigrate’ and then saying that it is getting better because more people are doing FAS courses. One major mortgage lender says it has seen a fall in new arrears’ cases every month for the past five months. Other banks say they have also seen a “significant improvement” in new cases in recent months. Industry insiders say banks face “major challenges” over the coming months as they begin the difficult process of pairing struggling borrowers with “longer-term” solutions that will soon be rolled out. We don’t work in a mono-banking environment, for any lender who says things got better, they may well have gotten worse at another, which is why we have to rely on the flow and gross figures of unpaids – taking the ‘gross numbers’ out demonstrates this. That the banks face major challenges is true, they will get better rights in the insolvency legislation but that won’t save them, the Keane recommendations will also come down the line and that is a sub-optimal solution as well – to call these ‘answers’ is like morphine being the answer for an illness, you can take the sting out of something but it doesn’t alter the fact that the underlying issue is real and serious. Many banks will also have to significantly improve their customer relations so that mortgage holders who fall into difficulty will no longer be afraid to contact their banks. The ‘tools’? They are lots of public money, forbearance, time, higher margins and job losses in banking. Whoopsyfuckingdo. Bombarded by that dialogue, the public has been left with the impression that one in 10 mortgages isn’t being repaid and will never be paid — and that the problem could get far, far worse before Ireland emerges from its financial abyss. The problem is that most of these venerable experts are talking through their hat. Yes, mortgage arrears have risen steadily over the last three years, and yes 10.2pc of households are now classed as owing more than 90 days of overdue mortgage payments. But you need to know a lot more than that to understand what’s really going on and how deep the crisis is or isn’t. This is (again) akin to saying that we don’t need to be overly concerned about 14% unemployment because not everybody is long term unemployed or unemployable. The other aspect of this is that the banks barely have a handle on what is truly happening because it is less than 12 months since they started to get the Standard Financial Statements in from clients – there were case files prior to that obviously, but they all have to be redone in the new manner and that is an operational nightmare. 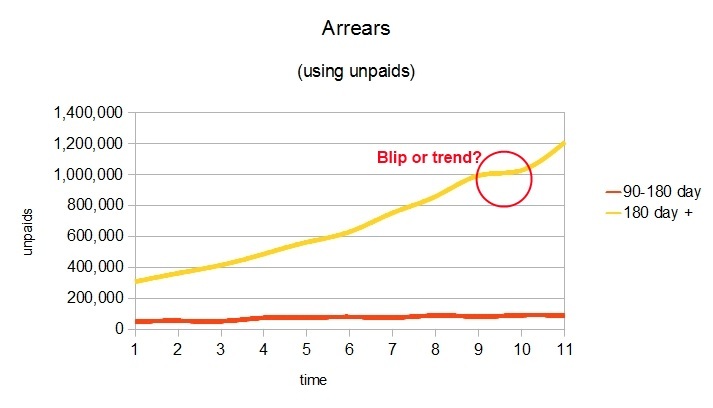 The other consideration is that dealing with arrears is not a scientific job, you can obviously see where earnings compression arises, or where an expenditure shock hits, but nobody has found a methodology to the probably ‘cure’ of same. You need to know how many of the people in arrears are making some payments and how many are making no payments. You need to know how many of those who aren’t paying simply can’t and how many of the defaulters are able to pay but choose not to. You need to know how many people who can’t pay are afflicted by temporary blips, such as unemployment, that’s likely to reverse, and how many people have mortgages so big they’ll never be in a position to meet their repayments. You need to know how many people struggling under mortgage debt are also being weighed down by short-term debt such as credit cards and car loans, and how many would be able to pay their mortgage once this debt is gone. You need to know how many people classed as being in arrears are in trouble now, and how many missed a few payments a year ago and are still “in arrears” because they haven’t yet paid down all the old arrears. An exhaustive trawl by the Irish Independent has revealed that the vast majority of this information is neither publicly available nor reasonably obtainable. So it seems highly improbable that the pundits have it at their fingertips. Many banks claim not to know the answers. Those that do won’t provide the information publicly, and most wouldn’t give it even under the protection of anonymity. The Central Bank has, very recently, gotten information about the number of mortgages that are ‘unsustainable’ and are unlikely to ever be paid down. None of this has been made public yet. That this information is not known is perhaps secondary, what is known are the main figures, and any analysis of them doesn’t support this argument. To say that ‘pundits don’t have the information and therefore it isn’t as bad’ is a contradiction, because it is the inverse which effectively states that ‘because they don’t have that information it is better out there’. The Department of Finance, where much of the government’s banking strategy emanates from, doesn’t have most of the information either. A material improvement will come later in the summer when the Central Bank publishes the results of a survey of 2,000 households in arrears. This sample is less than 2% of distressed mortgages, is it big enough to give a true analysis? We are hopeful, but there are things like selection of data, cause, correlating this so that you get a dependable and comparable dataset from a small selection and other issues that will always prove difficult. What is known and what is true are the main figures, and we can’t stress it enough, they tell a fairly one sided story – until they show some change in momentum this is going to be an uphill journey. This will shed light on the financial circumstances of those people and allow a more meaningful judgment on how deep the arrears crisis actually goes. Until then, dramatic proclamations should be treated with caution.